Anything any one of us can think of in this life comes straight from God, although he may not be given the credit for it we cannot remove the fact the earth is the Lords and the fullness thereof. 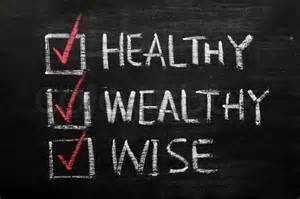 Health, wealth and wisdom all come from His hand! God wants His children to prosper and be in good health. (3 John 2). Beloved, I wish above all things that thou mayest prosper and be in health, even as thy soul prospereth. There are so many scriptures which tell us of health and healing, but of them all, the one that stands out we find in Isaiah of all that our Saviour took upon Himself for the good of man….. By His stripes we are healed! (Isaiah 53:3-5) He is despised and rejected of men; a man of sorrows, and acquainted with grief: and we hid as it were our faces from him; he was despised, and we esteemed him not. Surely he hath borne our griefs, and carried our sorrows: yet we did esteem him stricken, smitten of God, and afflicted. But he was wounded for our transgressions, he was bruised for our iniquities: the chastisement of our peace was upon him; and with his stripes we are healed…… (Psalm 43:5)……. (Jeremiah 30:17)…… (Psalm 107:19-21). Solomon teaches us how health, wealth and wisdom truly does come from God. (2 Chronicles 1:10-12). Give me now wisdom and knowledge, that I may go out and come in before this people: for who can judge this thy people, that is so great? And God said to Solomon, Because this was in thine heart, and thou hast not asked riches, wealth, or honour, nor the life of thine enemies, neither yet hast asked long life; but hast asked wisdom and knowledge for thyself, that thou mayest judge my people, over whom I have made thee king: Wisdom and knowledge is granted unto thee; and I will give thee riches, and wealth, and honour, such as none of the kings have had that have been before thee, neither shall there any after thee have the like.